I do—my favorite ones so far are Chicago, Mary Poppins, and Singing in the Rain, just to name a few. Bollywood movies are great, too, obviously. I don’t know who came up with the idea of having people dance and sing in movies randomly, but whoever did is undoubtedly a genius. 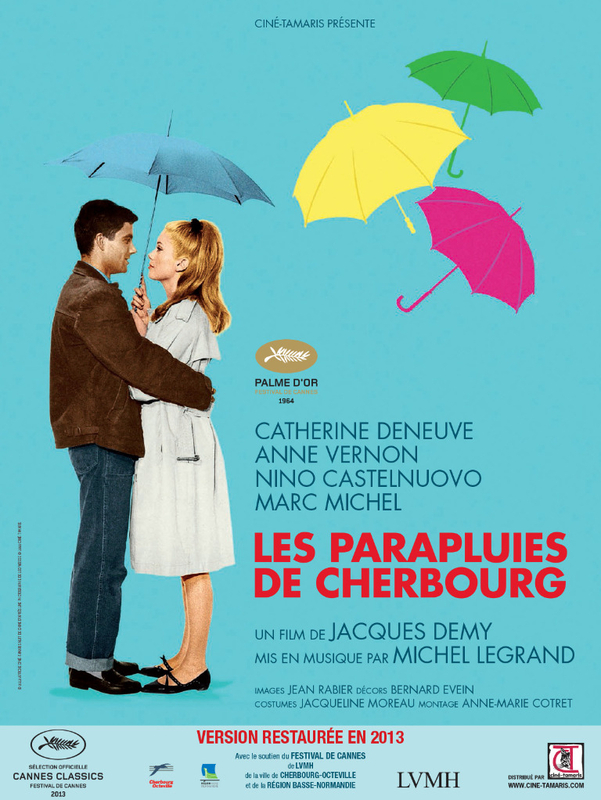 But my idea of a musical film was completely overturned when I watched Les Parapluies de Cherbourg (The Umbrellas of Cherbourg) by Jacques Demy. As usual, I went in the theater with only a vague notion of the film, namely that it is a 60s French film that’s also a musical. Imagine my surprise when the first line in the film was sang out by the lead guy, and every subsequent line in the film too. Yes, this is not so much a conventional musical film where people suddenly break into singing and dancing in between normal dialogue, but one where every single line is sung. After the first few lines, during which I needed to make sure I wasn’t hearing things, I was grinning from ear to ear. How can one not smile at the daring stunt the director pulled here? How can one not be amused by a movie where everyone sang to one another? I’ve always been impressed by directors who dare to challenge the norm (I’m thinking actors looking directly at the camera in À bout de souffle and 400 Blow‘s open ending), and Jacques Demy’s daring move was no less impressive. Where did he find the courage to put such an absurd idea into practice? Wasn’t he afraid the audience would hate the idea? More importantly, how did he manage to pull it off eventually? Coz I have to admit, after the first moments of ecstasy, I grew a little tired from hearing people sing out their every line. Interestingly, though, after that stage of mild annoyance, I started to accept the singing as an integral part of the film and followed the plot like it’s any other movie. I guess you can say Jacques Demy’s trick grew on me, most likely with a little extra effort on the script, the score, and the singing. All in all, I did end up liking the film. In fact, it seems to be very well received by critics – it won the Palme d’Or in 1964, and even earned a score of 98% on Rottentomatoes, more than fifty years after its release. I’m personally not going to put it on my top list of musicals, mostly because it’s not as fun a film as I imagined it to be, but it’s still undoubtedly a good, moving film. And thanks to Les Parapluies de Cherbourg, I will never make the same assumption about what constitutes a musical film again.